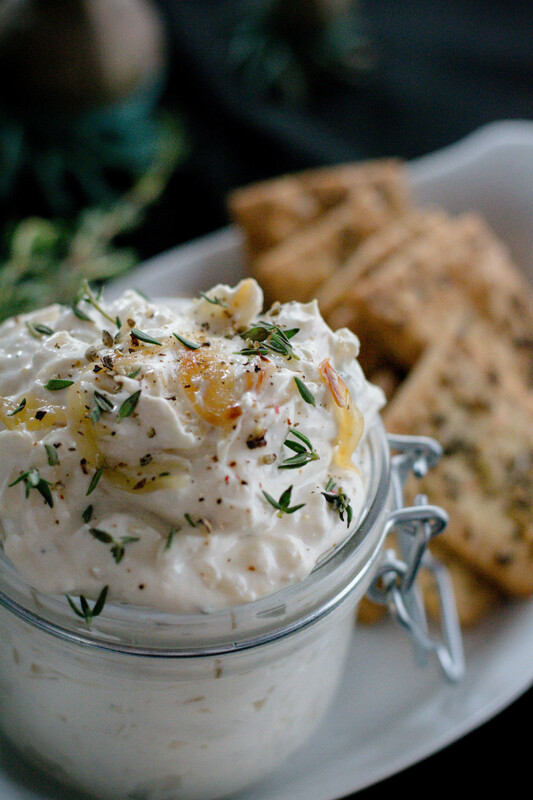 Caramelized Onion Dip - What the Forks for Dinner? In the world of eating, I am just the happy grazer. 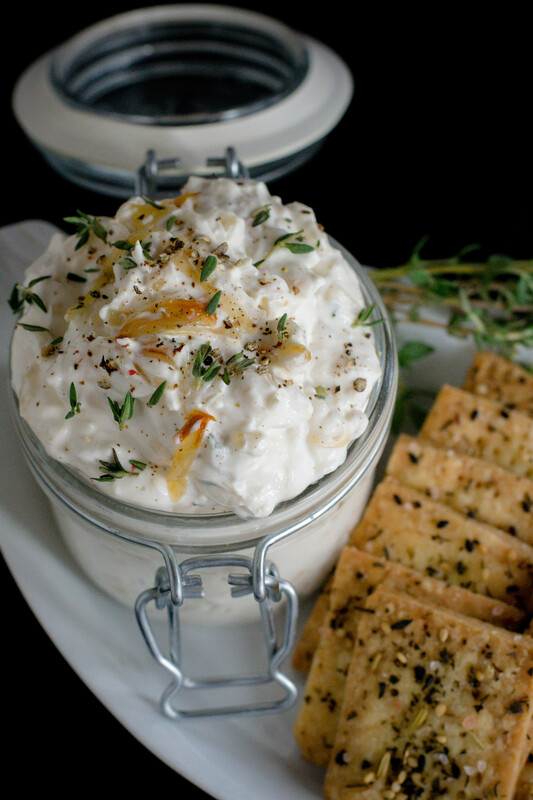 Caramelized Onion Dip fills that grazing need in me. With the Holidays rapidly winding down, New Years Eve is next. It has been a month of overeating, big meals, and a lot of overindulgence. Which will be coming to a screeching halt come January 1st….more on that in an up coming post. But, until then let the piggy wiggy continue. Christmas Day we spent at my brothers house and Tim made his Tim’s Awesome Prime Rib He has made this several times for family get togethers, but this year it was by far the best. If you are in search of a fantastic prime rib recipe you are in the right place. My Brother’s girlfriend Shari made some delicious potatoes, and my brother made bacon wrapped brussels sprouts that were to die for…..and I ate everything. Normally a whole slice of prime rib is too much, but I ate every bite…..oink! I had made Caramelized Onion Dip a few days before, so after a day of delicious food, dinner time ( we eat a noon meal on Christmas) came and neither Tim or I were very hungry, but wanted a little something……enter the happy grazer… Caramelized Onion Dip! It was the perfect snack. 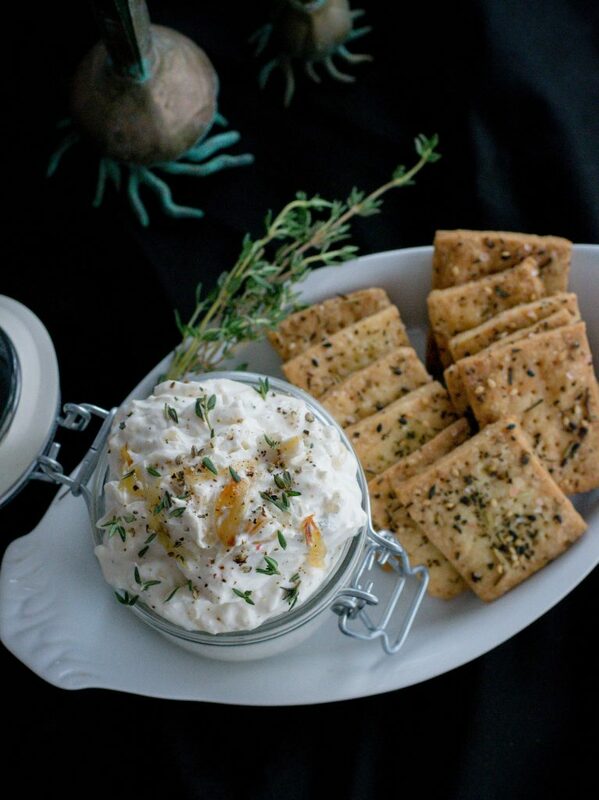 Caramelized onions, mixed with cream cheese, sour cream, a touch of thyme, garlic powder, and Worcestershire. Caramelized onions bring out the natural sweetness in onions, and mellows the flavor to what I can only describe as almost like butter. Cooking the onions in butter and a touch of sugar, they turn a beautiful golden brown and will melt in your mouth. Be sure not to have a high flame or you will burn them and they will have a charred taste. Low and slow! 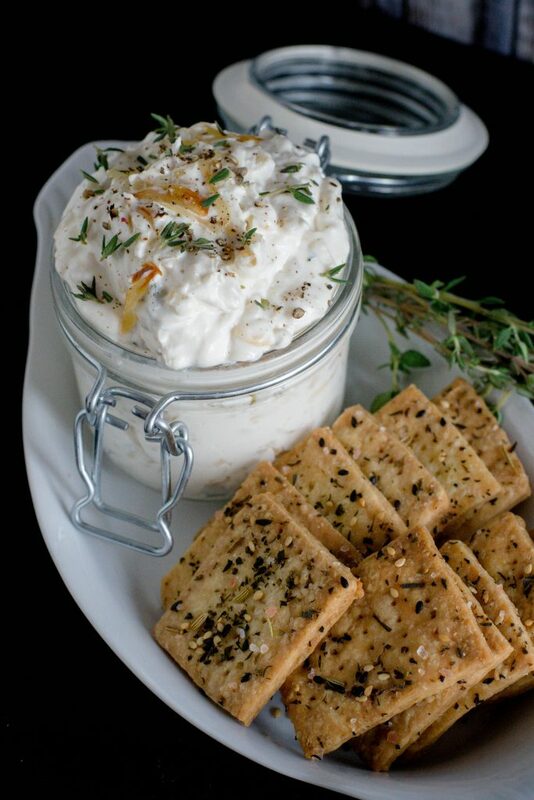 I made my own crackers……yes I made crackers……I have include the recipe, but potato or pita chips are equally as fine for your shipping pleasure…..I know….I tried them both….again…oink!! Over the next few days I plan to graze my way through the Holiday leftovers. They need to be gone and I can’t bear to throw away good food. 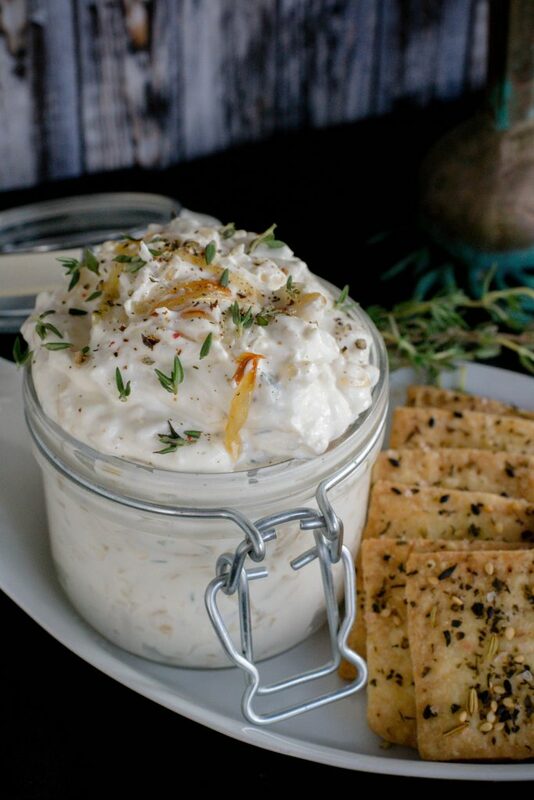 Caramelized Onion Dip will made a perfect take along for any gathering you still need to attend or is great to have on hand if you too are a happy grazer! In a large skillet,over medium heat, melt the butter. Add the onions and sugar. Cook, stirring occasionally, until onion start to turn golden, about 25 minutes. Add 2 tablespoons of water and cook, stirring, for another few minutes until the water has evaporated. Let the onions cool slightly. Transfer the onions, sour cream, cream cheese, thyme, garlic powder and Worcestershire sauce into a food processor, pulsing to combine ingredients. Season to taste with salt and pepper. Serve at room temperature. Dip can be covered and refrigerated for up to 3 days. Place the butter, sugar, salt, water and egg in a food processor and pulse to mix well. Add the flour and pulse only until the dough holds together Do not overmix. Roll the dough to 1/16 of an inch and trim edges. Cut into squares with a knife or pizza cutter. Transfer to a baking sheet. Mix topping ingredient in a small bowl. Spray the crackers light with nonstick cooking spray then sprinkle topping mixture over crackers evenly..
Bake 10-12 minutes, until golden and crisp.